I have known about this movie for quite some time now and I also saw some news relating to this sequel which to the best of my recollection was having few challenges. That's why the sequel only came after 5 years from the original movie, which was considered longer than the usual 2 or 3 years time (although some sequels could also take a decade or two, but those were usually movies that people did not expect to see a sequel). Anyway since the tickets were sold in advance from last weekend, my wife and I had already bought them for yesterday's show in Epicentrum as I insisted to see this movie at a studio with Dolby Atmos system. Well we should go on with the movie now. Jake (John Boyega - new Star Wars series, The Circle etc) was a man who made money from collecting items and exchange them with something more valuable, including Jaeger (robot built to fight the Kaiju monsters who came from another world through a breach of the earth) parts. During one of his usual "expedition", he encountered a teenage girl later revealed as Amara (Cailee Spaeny) who was able to build a Jaeger from the parts she collected. Both of them were later forced to join Jaeger program despite their reluctance. Jake would soon meet with his old ranger friend Nate (Scott Eastwood - Overdrive, Snowden etc) who was now a senior ranger and was the instructor for new cadets. Amara also met with her new team mates but she was having problem in blending in and learning to be the Jaeger pilot. Meanwhile Shao industries led by Liwen (Jing Tian - Kong: Skull Island, The Great Wall etc) were developing new technologies that would make Jaeger pilots no longer required. She was assisted by Dr. Newt (Charlie Day - Fist Fight, It's Always Sunny in Philadelphia TV series etc) who was previously with Jaeger team. Newt's former partner Dr. Herman (Burn Gorman - Crimson Peak etc) found out a fact that might have some significance with Kaiju's intention of destroying the earth. Soon after, the 10 years peace after the big war would be ruined, with the attack of an illegally operationed and powerful Jaeger which would be the beginning of something even worse. So could Jake, Nate and the rest of Jaeger teams be able to save the world again? Find them all in this cool sci-fi action movie. Well it was just a movie that I expected. It was a sequel of the film that I quite enjoyed back in 2013 titled Pacific Rim, but with mostly different characters. The only ones who still have roles in here were Charlie Day, Burn Gorman and Rinko Kikuchi (Babel, Kumiko, the Treasure Hunter etc). I believe it would be best to see the first movie before seeing this one to understand better on the war history plus the plot involving those characters. My personal view of the movie was it had a lot more action compared to the prequel. If you are a fan of those Jaeger fights in that movie, you would be amazed with the major screen time involving these fights. Especially since there were exciting Jaegers like Gypsy Avenger, Bracer Phoenix, Guardian Bravo and Saber Athena. Those fight scenes were totally amazing and intense and those who love to see big robots fight against other robot and big monsters should be satisfied. The special visual effects of the Jaeger fights were totally awesome and looked amazingly real to me, obviously with a major budget of USD 150 million, it was really worth it. The sound effects of Dolby Atmos was very good, though at times (during conversations among the pilots in the Jaeger, sounded a bit too loud and seemed broken). And seeing those big robots and monsters in a large studio was certainly the right choice as it gave the feeling the robots were really enormous. I think seeing this in IMAX would be a lot better. Aside from those cool actions and special effects, the plot itself was not really great. Basically the movie was focusing on 3 things, i.e the challenges Jake had to endure as the son of biggest hero, the Kaiju's plan to breach the earth again and Amara's personal struggle. John Boyega was able to portray his character brightly and he was surprisingly very charming and looked to have fun in here. Newcomer Cailee Spaeny was not bad either, while Scott Eastwood was pretty standard and not spectacular. The disappointing part would be the rest of the Cadets (and the supporting characters) whom I think did not have sufficient screen time to give us any sense of closeness and empathy towards them, including Jing Tian whose character felt a bit out of place. And the plot of Kaiju's re-appearance was probably a bit too short which did not give adequate room to absorb & understand. Maybe because the movie was not long enough as it was not even 2 hours including the very long end credit scenes duration to appreciate those wonderful visual artists. The movie also had some fun light moments, as well as the emotional moment in the middle which affected my wife a bit. It may not win the critics heart, but for my wife and I who love to see this kind of action movie, we thought it was intense, pretty awesome and we can still have fun by disregarding some of the obvious flaws mentioned above. I personally think that the movie might be appealing to certain type of audience, but definitely not all in general, which would be a sad thing if it's not successful commercially, especially since the ending hinted a third movie to complete the trilogy. There was no end credit scene if you are wondering, so you can hit the restroom immediately. If you are not a fan of this kind of genre, you might feel the movie to be too childish, light, illogical and so on. Especially if you do not like Transformers or Power Rangers movies. 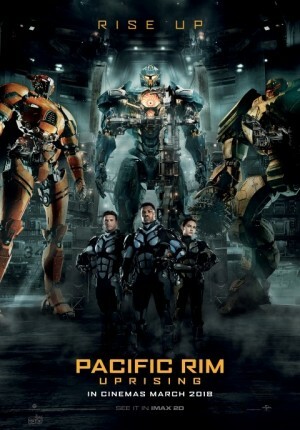 But if you are like my wife and I, then by all means, see this one and enjoy the Jaeger fights. The choice is yours.